Welcome, follow along with George Dutka in his journal which documents the additions and future thoughts for the HO scale White River Division model railroad and to his continuing historical New England railroad research. The White River Division is now in its 14th modeler's season. The "modeler's season" runs from November to April each year. Inspiration comes from the Boston and Maine, Rutland and Central Vermont Railway during the 1950's with additional posts by Don Janes and Peter Mumby. 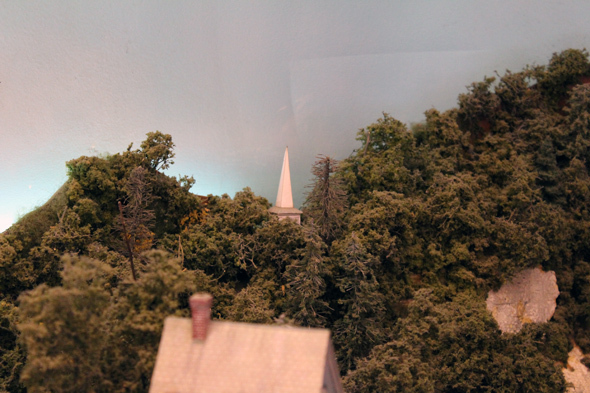 The Wharf Street S scale layout included just a churches steeple to suggest more structures are nearby. Not a hard structure to model...think that might work on the WRD. Check my Narrow Gauge blog later this week for more views of this layout. I think that's a great way to add more interest to the layout, I like the water. A plan with all the the major elements saved. CN at Rymal Pt. 10: Motive Power Part 5. CV Section House - White RIver Jct.